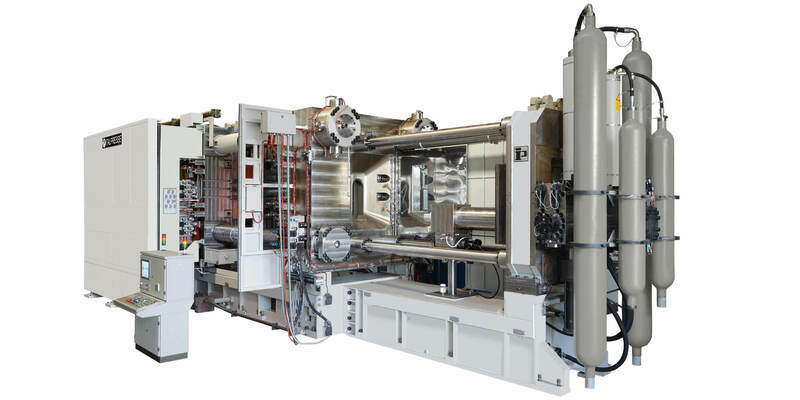 Italpresse Gauss has added a new model to its popular TF series of high-end toggle-free die casting machines: the TF 5600, with a closing force of up to 5600 tonnes. Since its invention in 2005, Italpresse’s toggle-free design has been adopted widely by the world's major automotive companies and equipment suppliers, thanks to its high performance, rigidity and reliability. As Automotive continues its shift towards aluminium to reduce vehicle weight, fuel consumption and emissions, global demand for light alloy castings, particularly for structural and safety critical parts remains on the rise. With the new TF 5600, Italpresse Gauss supports this trend, responding to customer demands for ever more rigid and reliable light alloy die casting equipment. efficient design: the machine’s neat and functional construction means it’s perfectly suited to working in demanding foundry environments. The machine rigidity, the generous dimensions of the platens (3500mm x 3500mm for the TF 5600) and the auto-adjusting parallelism (which ensures the best performance of the vacuum system), all make the TF series particularly suited for the production of structural parts. Due to the TF series’ scalable design, Italpresse Gauss is able to go beyond the new TF 5600 model in future, and will design and customise even larger machine sizes to customer demand.